My name is Atugonza Milton Isaac, and I have a physical disability. My challenge in daily life is when I’m moving too fast, if I’m climbing a hill, I feel pain. When I’m squeezed into cars I feel pain in my left hip. When I sit, this leg gets paralysed so much, it does not have much energy. My mum told me I was not born with this impairment. When I was about four years old I needed to have some teeth removed, so they had to inject me, but… those people were not qualified. My whole body got paralysed and from that, one leg does not have enough energy. My left leg is small, this one is big. My mother and grandmother told me that every morning they had to make me stand on this leg to see if I could balance. They’d have to take my leg and stretch it in order for those muscles to be strong enough. My mum cared for me a lot, she spent all this time with me. When I started school, I was the only younger boy with a disability. It was around 2001. All the boys were nicknaming me ‘Butcherman’, ‘limping’, ‘disabled’… So I grew up like this. But in life you need a challenge, you need to use it as a stepping stone. So I kept doing other things that impressed people – I was playing football, basketball, volleyball, and later on they realised that disability was not inability. If others can do it, why not me? Why not a person with a disability? 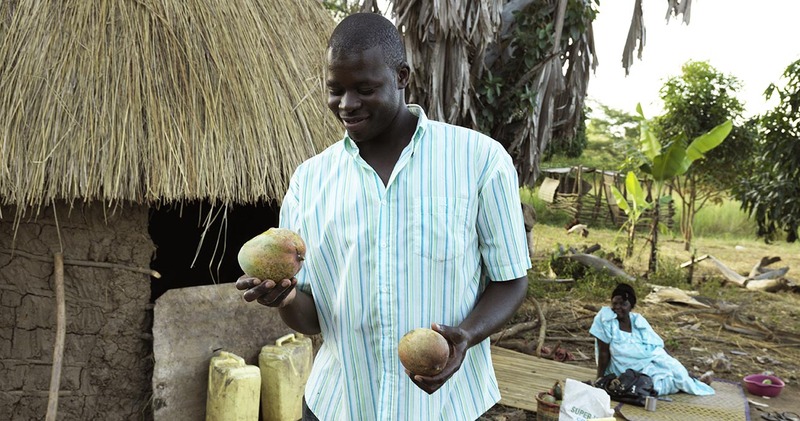 Atugonza at his family home, holding some of the mangoes he has grown. 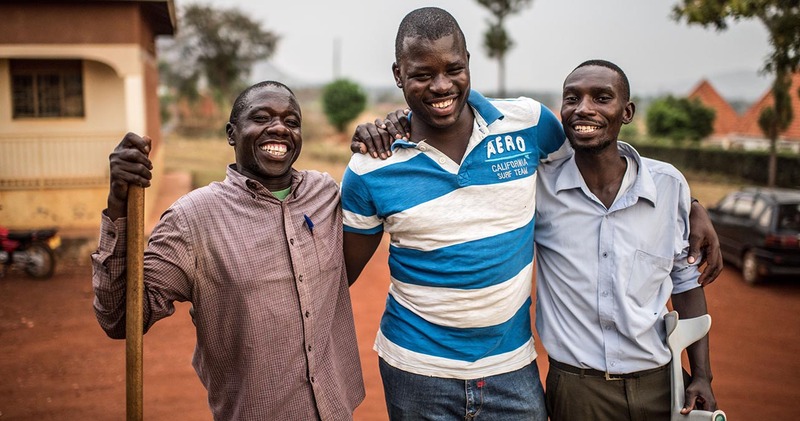 Atugonza with two other project volunteers and former participants of the Connecting the Dots programme. 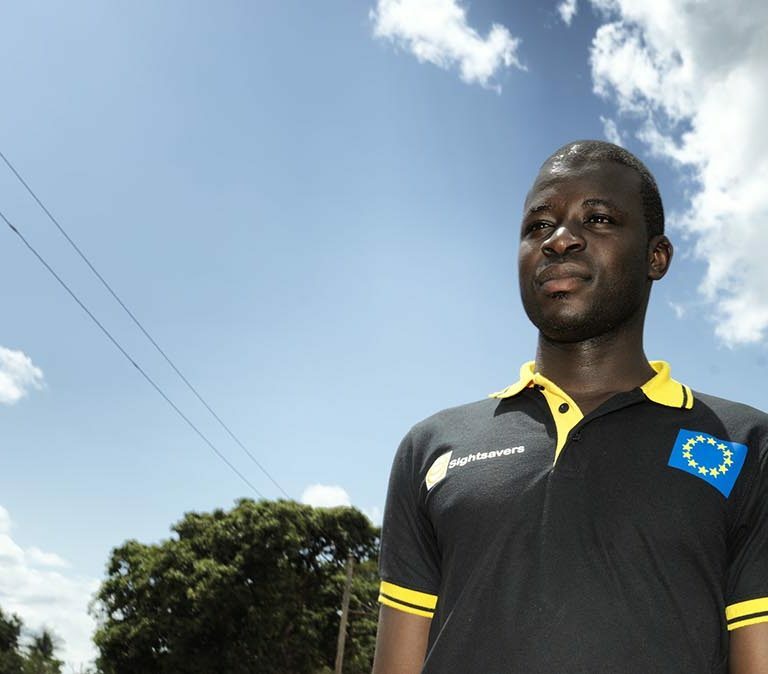 After studying and doing a one-year work placement, Atugonza joined the Connecting the Dots programme team as a volunteer. “Now I go into the field and monitor those students of Sightsavers. I visit students in their homes, to see whether their parents are supporting them. I report this back to the office – this one is doing well, this one has a challenge. My mission is empowering young people with disabilities to get self-worth, to see that they can also earn a living, to lobby for them to know their rights and benefits. Also I help them benefit from government programmes, such as special grants. People don’t know what disability means. They lack information. We have this kind of traditional society. [People] see it as a curse, so sometimes they keep you hiding there in dark corners. When visitors come, they say: “How many children do you have?” If you have six, you say “I have five plus a disabled one.” So they don’t count you as a child. It means you are good for nothing. That one can’t go to school, how can a deaf one study? That person can’t speak, can’t hear, how can he study? They don’t know about things like braille systems or sign language, so there are still many challenges. People think there are [only] a few people with disabilities. When Sightsavers came, it was like hunting for young people with disabilities – where are they? Then you find there is a big number. I thought I was the only one, but now we are together, we are networking. When you find a person with disabilities you feel like you are at home. For so many years you feel you can’t fit in, but now you can! 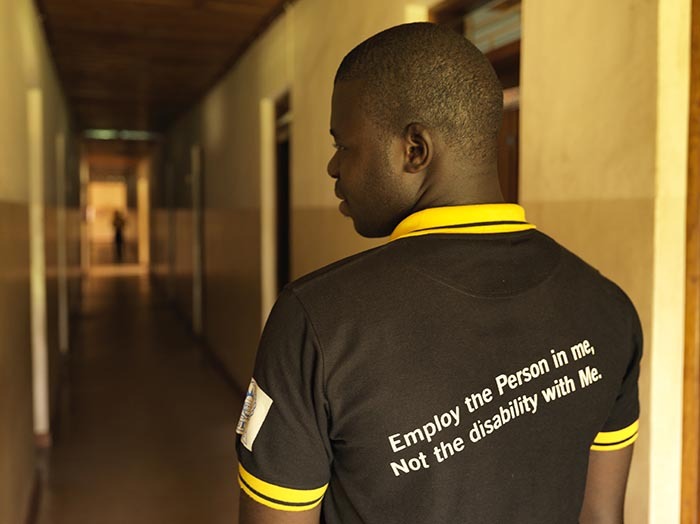 Atugonza's t-shirt reads: Employ the person in me, not the disability with me. The biggest impact of the programme? Now, young people with disabilities are benefiting, and not only from government grants. I have seen young people with disabilities doing great, great things. We are doing career fairs, putting our work on display. Now everyone knows disability is not inability. The European Commission has funded the economic empowerment programme since 2012, and additional funding was awarded in August 2017 by the Big Lottery Fund. This generous support has helped to transform the lives of hundreds of young people with disabilities in Uganda.